Jaguar has just released pricing information on the three all-new 2014 F-TYPE models. The new sports car joins the family as the “heir to the Jaguar sports car legacy.” The F-TYPE legacy goes back more than 75 years and continues in a tradition of highly desirable sports cars. The 2014 version features a new lightweight aluminum chassis and offers performance enthusiasts a two-seat, open top sports car with three levels of performance. 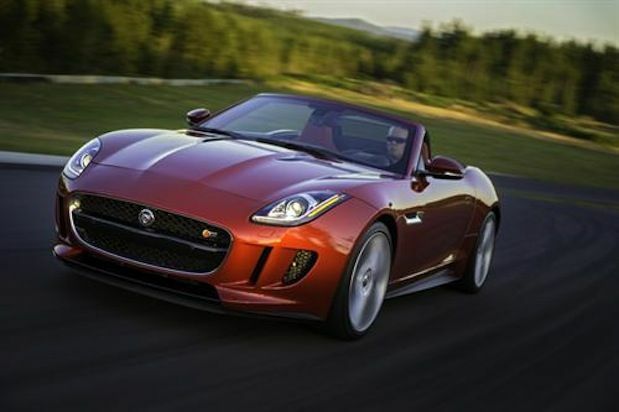 The 2014 F-TYPE offers true two-seat convertible sports car performance. The open top two-seater is powered by a 3-liter supercharged V6, with 340 horsepower. MSRP is $69,000 USD. The more powerful F-TYPE S gets the 3-liter supercharged V6, but horsepower is bumped up to 380hp. MSRP is $81,000 USD. The potent F-TYPE S V8 features a 5-liter supercharged V8 and pumps out 495 horsepower. MSRP is $92,000 USD. Prices do not include $895 destination. Jaguar which is now owned by the Indian company Tata Motors, has been expanding its lineup and the new F-TYPE is the return to the sports car era of performance and driving excellence. All the variants are focused on performance, agility and driver engagement. Jaguar engineers have produced the lightweight chassis and combined it with the F-TYPE’s aerodynamic styling and plenty of power for any performance enthusiast. All engines are mated to an eight-speed Quickshift automatic transmission, with a center console-mounted SportShift gear selector and steering wheel-mounted paddles for full manual control for more spirited driving. It will also come equipped with Stop/Start technology. The new F-TYPE has undergone extensive testing before it was produced and will give buyers a dynamic driving experience. The interior gets the classic Jaguar elegance and luxury and combines it with new high-tech controls. The new F-TYPE is not only luxurious and elegant but it will be fast. The sports car will sprint from 0-to-60 in 5.1 seconds. It lowers to 4.8 for the S model and 4.2 for the V8 S. The V8 S has a top track speed of 186 mph. The new sports car features a torsional and lateral stiffness prioritized to maximize handling agility in the corners. An available Configurable Dynamics program allows the driver to tailor a number of the dynamic features to personal taste and includes displays for lap timer and G-meter functions on the track. The F-TYPE also introduces a deployable rear spoiler and hidden door handles. Convertible top folds in 12 seconds at vehicle speeds up to 30 mph and includes a multi-layer construction using a Thinsulate lining for optimal thermal and sound-insulating properties. Jaguar also introduces the full U.S. lineup for 2014 which includes the XJ flagship sedan range that adds the XJR model with 550 hp. The XFR-S sedan features a 550hp supercharged V8, with production limited to just 100 units. The XK range continues to offer a true grand touring Coupe or Convertible, and adds the ultra-performance XKR-S GT with just 30 units available for North America, 25 for the United States and five for Canada.